This Rear Sway Bar is listed for the 1991-1997 80 Series Land Cruisers. Please be sure to pick the year Land Cruiser that you have below so we can assure you the correct part. All Used parts have a 90 Day Warranty on them. 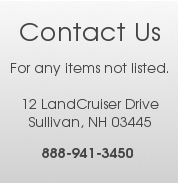 If there is any issue with any items purchased, please give us a call and we will be glad to help you take care of the issue.